Jupiter is a town rich with history; Jupiter is the outermost eastern point of land in the state of Florida. Jupiter’s history dates back to late 1500’s when Spanish explorers found the Jega Indians living along the banks of the Inlet River (now known as the Loxahatchee River) this was its only outlet for this into the Atlantic Ocean. The river was first shown on explorer’s maps in the late 1600’s. On Spanish maps the river was shown as the Jobe River. The English interpretation of Jobe was Jove which in turn later became Jupiter. In 1853 the U.S. Congress authorized the building of the Jupiter Lighthouse, which today remains a historic landmark. The Jupiter Lighthouse stands 105 feet tall and is built on top of a 46 foot hill located on the north shore of the Jupiter Inlet. Today Jupiter real estate is home to many exclusive communities like Admiral’s Cove, Bears Club, Ritz Carlton, and Jonathans Landing to name a few. Admirals Cove is one of Jupiter, Florida’s finest private gated communities in Palm Beach County and one of Florida’s premier golf and yachting addresses. Residents have backyard docks and Atlantic Ocean access with over six miles of winding inland waterways. Imagine your own exclusive residence among Admirals Cove homes, buttressed by private docks on six miles of wandering waterways, Intracoastal routes that all lead to the cerulean Atlantic. You’ll be completely enchanted by the Crown Jewel of private clubs. Home to 84,000 square feet of exclusive owners’ facilities, spa, dining, tennis- no detail has been missed in providing everyone a true resort experience. All club facilities are fully staffed and ready to serve you. In a way like perhaps nowhere else in Florida and in all its homes for sale, you can golf on championship courses, dine in exquisite style, sail to the Atlantic and enjoy a myriad of sports, social interactions and solitude too, all without ever needing to actually get in your car and drive away from this place you call home. Admirals Cove has its own deepwater 74-slip marina, marina shop, and marina cafe. In addition to accommodations for boats and yachts up to 130 feet, Admirals Cove real estate and homes for sale are directly set among 45 holes of championship golf. On the East Side, the Von Hagge Course has been newly redesigned and renovated, with views of beautiful lush landscaping and many waterways. The 2008 U.S. Regional Qualifier was held here. On the West side is the Village Course, consisting of 27 holes of challenging golf. The exclusive use, full-service Tennis facility is comprised of 12 Har-Tru tennis courts. East Side streets consist of both Harbor Homes and Estate Properties on Captains Way, Clipper, Commodore Drive, Eagle, Island, Mariner, Nautical Way, Quayside, Victory Drive, Regatta Drive, Schooner Lane, Spinnaker, Spyglass, and Waters Edge. The Golf Village streets consist of Golf Village, West Village, South Village, and Village Clubhouse. 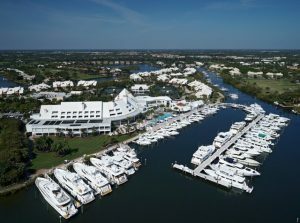 Enjoy a day on the greens and then take an evening out from your own back door to a private dock where your yacht waits to be boarded and taken on a waterway cruise on an overnight excursion to enjoy a beautiful ocean sunrise and fishing. Golf at championship courses and take in lunch at the magnificent clubhouse- there is none like it for your choice of fine dining or casual meals. Established in 2003, The Cove is an ultra-exclusive waterfront community located in Palm Beach Gardens, near the prominent luxury communities of Bear’s Club and Frenchman’s Creek. With no more than 20 custom-built homes, it is by far one of the most prestigious fine-living destinations in the city. Every home in The Cove represents the peak of luxury and design, with elegant Mediterranean styles, generous floor plans, and world-class finishes. These estates not only offer breathtaking views of the pristine waterway that weaves through the neighborhood, but allow you direct access via your own personal boat dock, which allows you to ply the waters all the way to the Atlantic Ocean view the Jupiter Inlet. Needless to say, this prime nautical opportunity is sure to favor boaters. 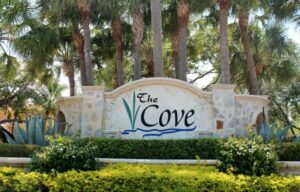 The typical residence in The Cove ranges from 3,000 square feet to over 6,500 square feet, including 3 to 5 bedrooms, multiple luxury guest suites with private baths, and 2 to 4 car garages. These are among the largest properties in the city. These homes are accommodating a wide variety of lifestyles, especially if you plan to entertain guests, thanks to such stunning amenities as summer kitchens, cabana baths, private swimming pools with spas, and even working fireplaces. To top it all off, despite its secluded tranquility, The Cove offers a central location in the heart of vibrant Palm Beach Gardens, with a wide selection of recreational and leisurely options right around the corner. You’ll no doubt enjoy an unparalleled standard of living in this exceptional community.